This unit is designed to address a common problem in wireless voice communications today: To maintain quality speech content and control the deviation levels at all times. Once easily calibrated to your radio transmitter, the DSL-300 will provide +/-12 dB of gain to your transmitted audio levels while ensuring low distortion and no clipping of the audio signal. Ideal for HF, VHF, UHF and link transmitter applications, all users operating on your radio system will be driving the transmitter with the same audio levels. Users with low deviation levels will sound just as good as the user with the highest level of deviation. 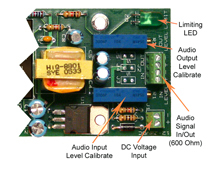 The device does not enable "Hot" users to drive the transmitter into hard limiting (clipping) thereby reducing the quality of their transmission. When used for telemetry purposes, the DSL-300 provides nominal deviation with both weak and strong signals. This is an important key feature for linked voice or other telemetry / mixed signal systems. For example, a user with an average frequency deviation of 2.5 kHz will now be re-transmitting with a typical deviation of 3.0 kHz or whatever you have the DSL-300 calibrated for. *The DSL-300 can be configured with different impedances. Contact us for options.